@Erg Please include @AstroBryGuy fix directly inside you mod package. Please include AstroBryGuy fix directly inside you mod package. OK, I'll do it, but it can take some time as I'm currently busy and the fix is not so straightforward. In fact, for versions other than BG:EE, I'll have to write code to detect if the Beta Component of the BG2 Fixpack is installed or not. @Erg Great, how about my previous message? Erg Great, how about my previous message? The only problem with the template is that my download link currently changes when uploading a new version. When I'm done updating the mod, I will send you a PM to discuss which are the options to avoid that. I would be even more grateful is someone could translate in Polish the additional strings and the setup.tra in the zipped file attached below. @Erg don't worry I'll handle everything. Let you know when it's done. What should I do if I want to use this with Item Revisions? Should I install it before or after IR? Or is it even compatible at all? I'll check and let you know for sure. However, if I have to guess, it will likely be incompatible on BGT, but it should be compatible on the other platforms (vanilla, tutu and BGEE), if you install my mod last and maybe even the other way round. Only issue I can think of is description not fully reflecting the actual properties of the staff. Anyway, I'll post here my findings after testing with IR. Thanks for checking! I'm using bgee with sod from beamdog. First of all, I'm currently working on a major update of my mod, so you should wait anyway for its release. That said, I've checked potential issues with IR. On BGT, the mods are incompatible in the sense that the last one installed will override all the changes from the other one, but they can still be used together, if you are OK with that. On BGEE (with or without SOD) and Tutu they will work fine together, if you install my mod after IR, but the description will not fully reflect the actual properties of the staff. For example, IR decreases the staff THAC0 by 1, so if you install both mods (with my mod last), the actual THAC0 will be 2, +3 vs. Lycanthropes, but the description will still say 3, +4 vs. Lycanthropes, etc. Also the new properties added by IR, like Parry: +2 bonus to AC (none vs. missile), etc. will be present, but not shown on the staff description. I may be able to fix the description (I'm already using regular expressions to replace strings, so I could add a few more) and make the mods fully compatible. I will let you know if it worked when the new version is released. Erg, I really appreciate the quick response and the effort. Do you have an ETA for the new mod release? I would like to take your advice and wait for it. I hope to be able to release it in a few days. Maybe by the end of the week, but it's hard to tell in advance. 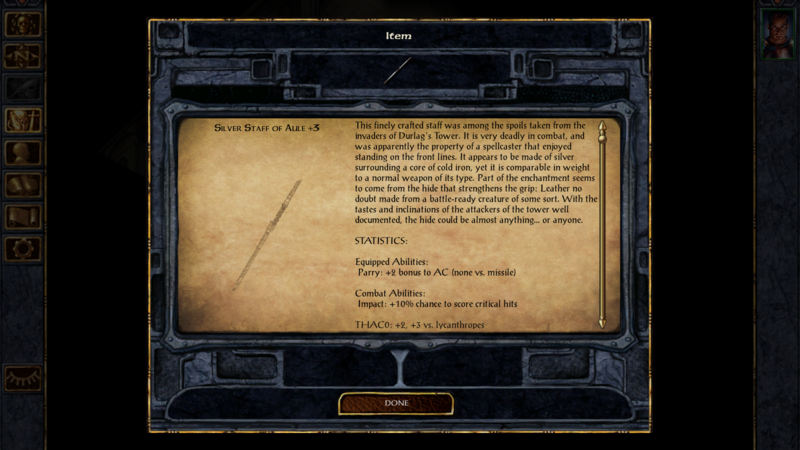 This version is stable and safe, but still not fully compatible with mods like Item Revision. Sure, I'm interested. I like the new icon. I'm installing stuff right now, planning on playing this weekend, so I might just install what you have and not worry about the description right now. Then I can reinstall when you finish. try the version attached below. v10.0 BETA works only on the English version of BG:EE (for now), but it is fully compatible with IR, if you install my mod after IR. 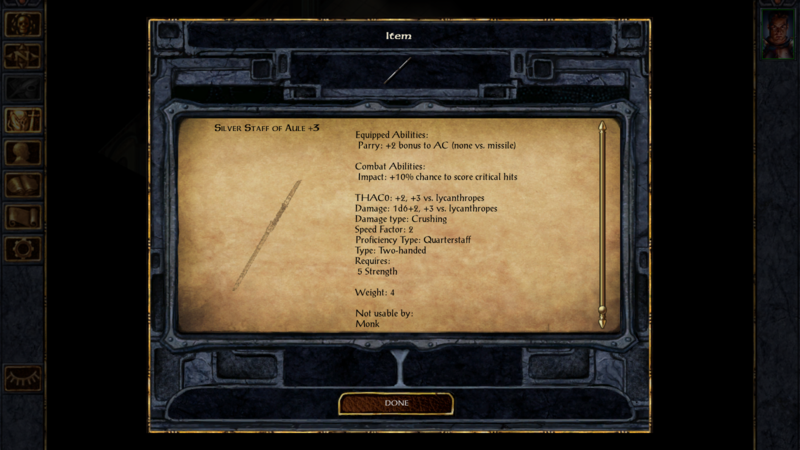 It should also be compatible with almost every other mod altering the same item. Alright, I installed it! I already had SCS and TweaksAnthology installed, so I just installed it after them. Hopefully that's ok. I like the composite IR version -- the Parry thing is cool -- so that's what I went with. Thanks! Yes, it should be fine to install it after SCS and TweaksAnthology. I'm not sure why, but installing this mod on version 1.3 seems to break the Gavin NPC mod and crash the game at the Beregost Temple. Unfortunately, I don't have those logs any more, but it's at least an FYI for anyone who was thinking of using both. my mod only affects one item and I really don't see how it can be incompatible with Gavin. Regardless, I've tested it anyway and it works fine for me. In my case it is BG:EE 2.3, but it should work on 1.3 too, there is no reason why it should not work. @Erg Next time I do a clean install, I'll try to reproduce it. I agree it makes no sense, but removing the Silver Staff made Gavin stop crashing my game. It's possible that there was some weird interaction between those two and one of my other mods since I have far too many at this point. It's possible that there was some weird interaction between those two and one of my other mods since I have far too many at this point. I'm pretty sure there is no interaction whatsoever between my mod and Gavin. I double checked and none of the files modified by Gavin is touched by my mod and viceversa. Weird interactions between my mod and other unspecified mods are also unlikely to cause crashes (but I cannot be entirely sure without knowing which mods are those). 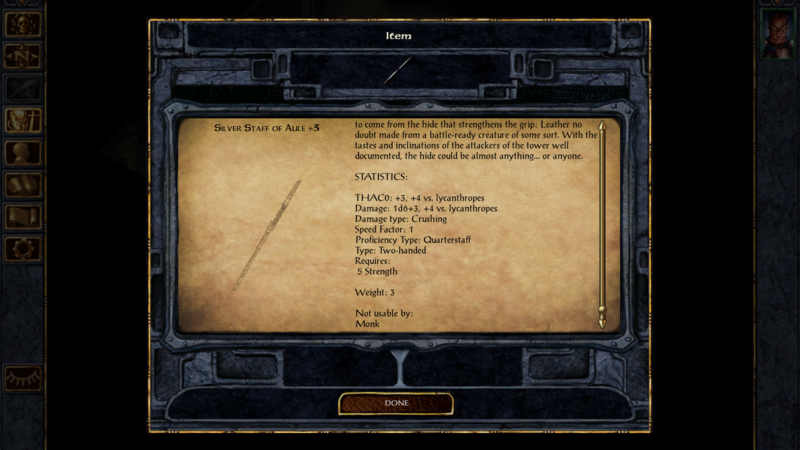 In case of incompatibilities, the worst that should happen, with the current version, is that the staff's description may not reflect its actual properties, but I'm already working on an update that will address also this issue. 1) were you playing in English or in another language ? 2) when were you experiencing the crashes ? During dialogues, on entering the Temple area or something else ? 3) were the crashes consistently happening in the same circumstances or they were kind of random? 4) did you have the silver staff in inventory ? Did you have it equipped ? 5) was Gavin in your party ? That's all I got for now, feel free to add anything that you remember and that you think it may be of interest. 5) Gavin was not in my party since getting near him made me crash. If you're curious, I can give you a rough list of the other mods I had at the time since they're similar to what I'm playing with now. But I could install Gavin or the Staff separately without the game crashing. It was only when I added both that it stopped working. Also, I don't think I ever tried installing Gavin before the staff; I think I only installed him after. First of all, I owe you an apology, because I've almost dismissed your claim as nonsensical, but you were right and I've finally managed to reproduce the problem. The problem occurs in version 1.3, but strangely enough not in version 2.3, and if both Gavin and my mod are installed irrespective of order of installation. In my tests there were no other mods, so the problem seems caused by some weird interaction between my mod, Gavin and BG:EE v1.3. I still don't understand why this is happening, but now I should be able to perform additional tests and hopefully pinpoint the cause. @Erg You're welcome. And, to be fair, it is pretty nonsensical. It took some trial and error for me to even realize that your mod was the issue. Item mods are usually pretty safe. I'd be interested to know what's causing the crash if/when you track it down. I'd like to be able to use both mods together at some point and I'm probably not going to update my game for a while. I'm holding out for a few more bug/UI fixes first. I've found the problem. It was a stupid mistake on my part. Gavin has nothing to do with it. In the latest update of the mod, I've added to the staff a new opcode introduced in BG:EE with the patch 2.0. The new opcode is not used by the mod if the old engine is detected (i.e. in vanilla BG1, Tutu and BGT), but I forgot to check also for older versions of BG:EE. In 1.3 that opcode doesn't exist and this was causing the crashes. I don't fully understand why the game crashes even when you don't have the staff in inventory and what Gavin has to do with it, but removing the opcode fixed the problem. Of course, the file attached below must be used only in BG:EE 1.3 or previous version as the mod works fine as it is in 2.0 or later. Edit: removed the temporary file, get version 9.1 or later instead. Thanks @subtledoctor. I was going to search for this information and you saved me some time. @Erg Glad you found the issue and thanks for the fix. Time to go bludgeon Karoug to death.